From Goodreads ~ I’m going to tell my story. With those words, eighty-three-year-old Arthur Manuel set his remarkable First World War memoir in motion. Hidden in the Manuel family records until its 2011 discovery by his grandson David Manuel, Arthur’s story is now brought to new life. Like many Great War veterans, Manuel had never discussed his wartime life with anyone. Determined to escape his impoverished rural Newfoundland existence, he enlisted with the Royal Newfoundland Regiment in late 1914. His harrowing accounts of life under fire span the Allies’ ill-fated 1915 Gallipoli campaign, the Regiment’s 1916 near-destruction at Beaumont-Hamel, and his 1917 Passchendaele battlefield capture. Manuel’s account of his seventeen-month POW experience, including his nearly successful escape from a German forced labour camp, provides unique, compelling Great War insights. Powerful memories undimmed by age shine through Manuel’s lucid prose. His visceral hatred of war and of the leaders on both sides who permitted such senseless carnage to continue, is ferocious yet tempered by Manuel’s powerful affection for common soldiers like himself, German and Allied alike. This poignant, angry, witty, and provocative account rings true like no other. Arthur Manuel was a young man living in Newfoundland, then still a United Kingdom colony, when the first World War (the Great War) broke out. 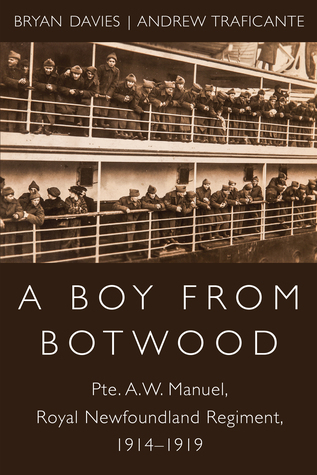 Growing up in poverty and not having a lot of opportunities, Manuel joined the Royal Newfoundland Regiment (RNR) and was sent overseas to fight a war with little training. This is his story of his experiences from 1914 to 1919, as a soldier and prisoner of war. We all know the horrors of war but this book provides Arthur's version firsthand. He tells of his disdain for the leaders heading up the English military who publicly broadcasted that things were going well when, in fact, they weren't. Arthur's fellow soldiers and friends were getting massacred in battles they had no chance of winning. He tells of his experiences as a prisoner of war ... some of the camps they were treated badly and starved whereas others the Germans were civil to them. Arthur never spoke of any of this until 1980 when he bought a dictation machine and recorded his story. He had it transcribed and then it got packed away until it was discovered by his grandson almost thirty years later (Arthur was long gone by this time). I enjoyed the writing style of this book. It is in Arthur's words, with interjections from the authors to explain what was going on at the time. Though it is a difficult book to read because of Arthur's experiences, it was also very interesting and illuminating to the horrors of war to a poor boy from Newfoundland. Gord's great grandmother was a Manuel in Newfoundland ... I imagine he is related to Arthur somehow. One of these days, I'll see if I can figure it out.